Are You Being Scammed by Facebook Ads? Facebook says it has dumped Microsoft banner ads, but what the social network really needs are fewer sleazy advertisers, not less Microsoft. 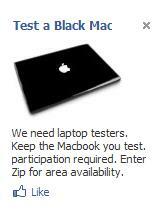 For example, ads like to one that invites Facebook members to "test" an iPad, Kindle, or Mac that they then get to keep, "participation required." Maybe you have seen career ads that mention an age, but suggest a job that makes no sense for someone in that age group. 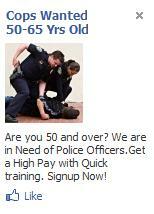 Become a cop between 50 and 65? Not likely. These ads are a natural outgrowth of the pay-for-clicks business model combined witth an "anything for a buck" attitude at Facebook. Since FB doesn't charge for merely running an ad, there isn't much incentive for self-control on the part of advertisers. The media keeps talking about what a great success Facebook is, and indeed it is supposed to cross 400 million users sometime this week. That is a 50 million member increase from December. With such a huge audience, Facebook ought to be able to find classier ways monetize the service than with many of the ads it presents to members. For businesses, Facebook offers easy and inexpensive targeted advertising. However, customers can never be sure of the context in which their ad will be presented. Will your company's ad be next to a Coke promotion or below an ad headlined "Cops Wanted, 50-65 Yrs Old?" You won't know until your ad appears, and the positioning will be different based on the individual member's preferences and demographics. While researching this story, I asked a friend to look at the ads Facebook was sending him at the moment. Of the nine, he only considered one to be a legitimate ad reasonably targeted to him. Many of the others were bizarre targeted ads, such as one that combined his college with an insurance offer. Facebook claims to have real humans involved in approving this ads. If that's true, why did I see a commercial ad--another school, I think--that included the official logo of the U.S. Department of Homeland Security? Who approved that? Perhaps, Facebook is a victim of its own success. It is remarkably easy to create an ad and precise targeting is offered. It is no surprise that people will try to take advantage. You can, for example, have an ad delivered based on any combination of age, relationship status, interest in men/women, location (down to city), education, language, and whom or what they are connected to on the service. You can even create an ad that only appears on someone's birthday. The ads are easy to prepare and you can create as many variations as you wish. This is part of what leads to the overuse of targeting information in Facebook ad copy. (Tony Bradley is today talking about how targeted ads can work for small businesses. He uses Google as an example, the his comments apply to Facebook, too). Facebook is potentially a very powerful medium for advertisers of all sizes. It has a large audience that can be sliced and diced to meet advertising requirements. The ads themselves are performance-based, inexpensive, and simple to prepare. They point to your existing online presence or can be customized to meet advertiser requirements. This should make Facebook a prestige medium for advertisers, but until the service can say "No" to questionable advertising it will be more like late night television, or worse. Tell me about the ads you see on Facebook. Are yours as bad as what I see?